The Putz has published a bestselling memoir of his actions. It could be that his bomb wasn't strapped on quite right. 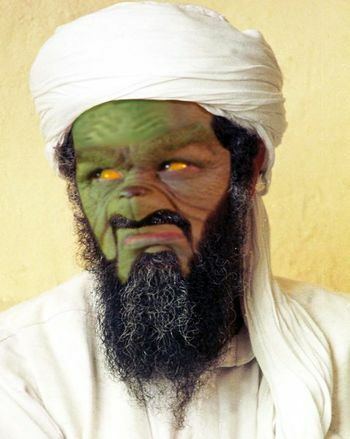 It could be that the turban on his head was too tight. May have been that his beard was two sizes too small. At the glowing Menorahs below in the town. Was busy now, playing dreidel without grief. "And they're putting on yarmulkes!" he snarled with a sneer. "Tomorrow is Hanukkah! It's practically here!" "I must find a way to keep Hanukkah from happening!" Then the Jews, young and old, would sit down to a feast. And they'd FEAST! FEAST! FEAST! F***ING FEAST! Which was something that made the Putz want to puke! Would stand close together, with Hanukkah bells ringing. They'd stand hand-in-hand. And the Jews would start singing! The more the Putz thought, "I must stop this damn thing! Why for seventeen centuries I've put up with it now! I must stop Hanukkah from coming! The Putz got a wonderful, awful idea! "I know just what to do!" The Putz Laughed in his throat. And then made a quick rabbi yarmukel and robe. "With this coat and this hat, I'll look just like a Rabbi!" "If I can't find a Jewdeer, I'll make one instead!" "All I need is a Jewdeer..."
The Putz looked all around. But since Jewdeer are scarce, there were none to be found. Did that stop the old Putz? So the Putz called his camel Achmed. And he tied a Star Of David on top of his head. Then the Putz screamed, "Jihad!" All their windows were dark. Flying shrapnel filled the air. He jumped through the window, and fell like a klutz. But if Moses could do it, then so could the Putz. He lay on the floor, for a moment or two. Then he stuck his head out to look for a Jew. He saw the little Jew yarmulkes all hung in a row. "These yarmulkes," he grinned, "Are the first things to go!" Around the whole room, and he stole every present! Dreidels! And menorahs! Gelt! Money! And drums! Gefilta Fish! Latkas! Matzo! And plums! And took back outside all the bags he could hold! Then he slunk to the icebox. He took the Jews' food! He took the Jew-pudding and their matzo ball soup! Why, that Putz even took their last can of Jew-hash! He raided everything in the house with an ecstatic aura. "And now," grinned the Putz, "I will jack these fools' Torah!" When he heard a loud sound like the shot of a gun. He turned around fast, and he saw a small Jew! 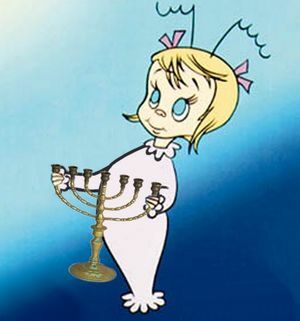 Little Cindy-Lou Jew, who was not more than two. Why are you taking our Torah? Why?" "There's a tear on a page thats almost five inches wide. So I'm taking it home to my workshop, my dear. He wondered what was next, and began to think. Then the old Putz carried out all he could handle. He left nothing but hooks, and a sandal. Was a crumb that was even too small for a louse. For the other Jews' louses! Packed it up with their presents! The dreidels! The food! The menorahs! The Torahs! The matzo ball soup! He packed it up with their presents! The dreidels! The food! 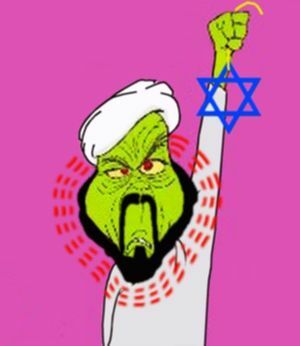 "Screw all the Jews!" he was Putz-ish-ly humming. "They'll soon find out now that no Hanukkah is coming! Then all the Jews down in Jewville will all cry Boo-hoo!" He did hear a sound rising over the sand. He stared down at Jewville! The Putz popped his eyes! 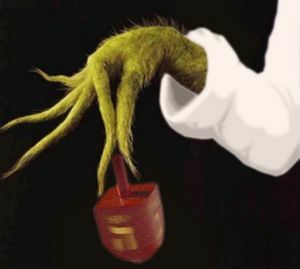 He hadn't stopped Hanukkah from coming! Stood puzzling and puzzling: "This wasn't planned! It came without yarmulkes! It came without rags! It came without matzo, dreidels or bags!" Then the Putz thought of something he hadn't before! "Maybe Hanukkah," he thought, "Doesn't come from a store. Maybe Hanukkah...perhaps...means a little bit more!" The Putz's small beard grew three sizes that day! And he brought back the toys! And the food for the meal! The Putz ate the matzo with zeal! 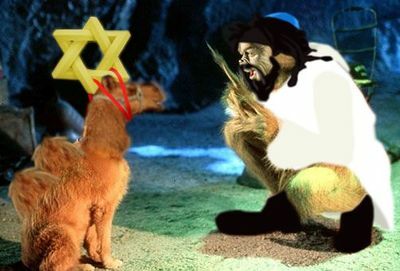 The Putz Who Stole Hanukkah is part of Uncyclopedia's series on Mass Media. This page was last edited on 24 December 2016, at 17:51.